Where is it legal to sell recreational marijuana? To date, four states have passed legislation allowing the sale, possession, and recreational use of marijuana: Washington, Colorado, Oregon, and Alaska. Though state-level legalization has been passed, not all local jurisdictions allow the sale of marijuana, and legalization initiatives for Oregon and Alaska are not slated to take effect until mid-2015. How is the selling of marijuana regulated? The sale of marijuana for recreational use is a very new industry and is still in the midst of developing standardized legal practices by the governments that have chosen to allow it. The Colorado Department of Revenue issues a Retail Marijuana License that makes distinctions between marijuana stores, marijuana growing facilities, marijuana product manufacturers, and marijuana testing facilities. Washington utilizes the standard state business license issued by its Department of Revenue, but requires marijuana sellers to obtain an endorsement from the State Liquor Control Board as well. Like Colorado, Washington distinguishes between marijuana producers, processors, and retailers, with rules governing the combinations of endorsements a single entity may hold. In addition to state regulations, marijuana sellers may be subject to specific county and city laws. Denver, for instance, currently requires any applicant for the retail license to have first held a valid Medical Marijuana License from the city and state. Who is eligible to sell retail marijuana? Different jurisdictions have different eligibility requirements, but most tend to agree that applicants must be, and employ, persons of at least 21 years of age with no history of felony convictions. Colorado has a two-year residency requirement for retail marijuana applicants. Applicants for licenses to sell recreational marijuana can expect to undergo background checks, state inspections of their facilities, and audits of their business plans. Typical attachments to the application may include a Certificate of Good Standing from the Secretary of State, floor plans of the marijuana facility, a tax bond, and Articles of Incorporation or a Partnership Agreement if applicable. Once submitted, applications can take up to 90 days to be approved or denied. The cost of a retail marijuana license is usually much higher than that of a standard retail license. After background check fees, fingerprinting, inspections, application fees, and initial license fees, the cost will likely be in the area of several thousand dollars. In the states in which selling is allowed, retail marijuana licenses are typically issued for one year, after which they must be renewed. Renewing generally entails paying the annual license fee and submitting annual business reports required by the licensing board. 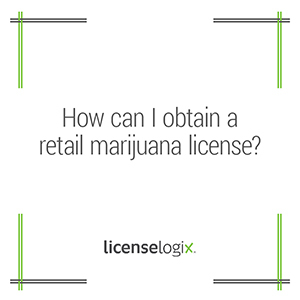 LicenseLogix will research the retail marijuana license requirements specific to each state and local jurisdiction in which you plan to do business. Your Dedicated Account Manager will then prepare and submit your business license applications and consolidate all license fees into one simple invoice, saving you time, money, and frustration. Once your licenses have been issued, we ensure that you renew on time and remain up-to-date on breaking marijuana legislation that affects your business. Let the experts at LicenseLogix navigate the nuances of the emerging marijuana industry. Live chat with our license professionals or call 1-800-292-0909 today.